Are you just itching to get started building the outdoor living space you’ve been dreaming of? Don’t wait until Spring – there’s too much to do! If you want to be enjoying your new patio or screened-in porch during the height of next summer, Fall is the ideal time to get started. There are numerous decisions to make and resources to put in place before you break ground, so the earlier you’re thinking specifics, the better. Here are a few planning tips that can improve your outdoor living project right from the get-go. Go pro. Homeowners tend to wait until they have every detail nailed down before talking to a professional. That’s a mistake. Your contractor should be a resource that’s available to you throughout your planning process, so you want to find them early. With the foundation of a relationship established in the planning phase, you’ll be more likely to get a slot on your chosen contractor’s project calendar, which will surely fill up fast come Spring. Get multiple estimates. Don’t feel guilty about interviewing and getting estimates from companies which won’t ultimately wind up completing the work. Contractors understand the nature of their market, and if a company is worth its salt, talking to potential clients will be built into the business. Here at NOVA, we’re happy to help you explore your options, and our customers are our most valuable assets. We also understand that we’re not the right match for everyone. No matter where you live or whom you’re thinking of working with, you need to make an informed decision, and it’s in your best interest to obtain and compare multiple estimates. While you’re at it, be sure to ask educated questions, especially where warranties are concerned. Understand your space. Early into your planning process, you should map out your yard and your ideas for it. Make a note of natural contours and elevation changes that could be used functionally for seating or as a boundary. Also, shoot a few photos documenting your home’s color palette. You’ll want to choose finishes that flow naturally with the existing colors and textures. Go shopping. You might feel as though your vision is already inspired, but when it comes to hardscaping, the possibilities are truly endless. To find out what’s possible, gain an understanding of different price points, and add optimal features to your new space, it pays to spend some time exploring carefully planned and built-out spaces. Here in Northern Virginia, you can see everything in one place at Outdoor Showplace. Plan your budget. As with any significant investment, it helps to think of the budget for your landscaping project as a range. By starting out aiming for the low end of the spectrum, you can account for splurges, upgrades, and missed considerations without breaking the bank. If you’re ready to roll but the financial component of your timing isn’t quite right, low-interest lines of landscape financing credit can help you avoid delaying your project. Consider connectivity. 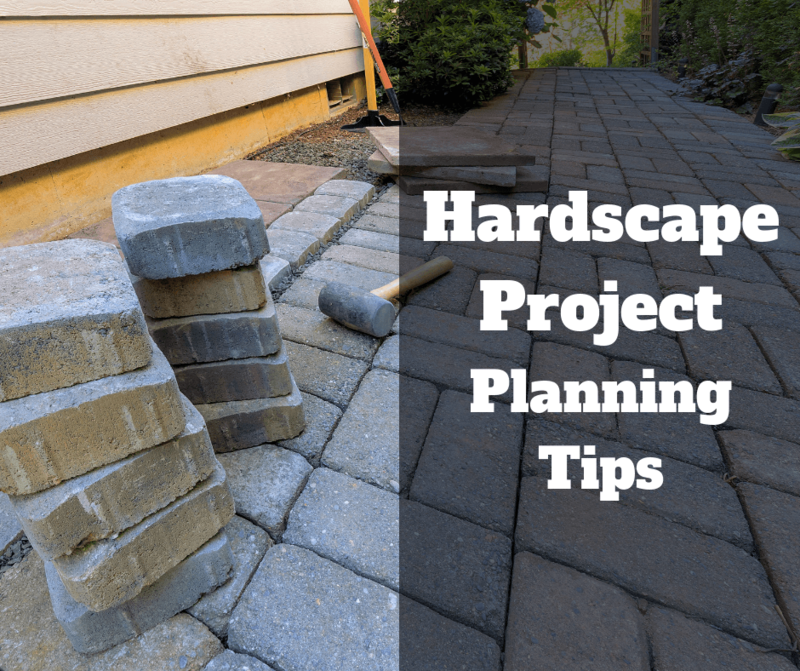 Most people factor in the basic utilities — electric, gas and water — when undertaking a hardscaping project. However, modern technology creates practically limitless options for connecting your outdoor living space to the rest of your home. Once you’ve covered the basics, be sure to consider how you want this new area to sync with other systems – security, sound, Wi-Fi, lighting, and so on. Make the priority of these connections known early on and be diligent in making sure their integration is included in estimates. Make resale a factor. Unlike other landscaping elements, custom hardscapes should last decades or generations. Even if you don’t plan to sell your home in the foreseeable future, your outdoor living space will continue to impact the selling price in the unforeseeable future. By choosing a high-quality contractor, timeless styles, and durable materials, you can maximize any addition to your property value. Prepare for the unexpected. The ideal hardscaping client is serious about their project, pays attention to details, and maintains a sense of humor. In a large-scale project involving numerous moving parts, it’s impossible to foresee every twist and turn. Your hardscaping project will bring together custom design, natural materials, manufactured elements, and outdoor conditions. Something unexpected is bound to happen. By hiring an experienced company and actively communicating, you’ll ensure your project remains adaptable as realities unfold. Don’t forget about plants! Hardscaping and landscaping complement one another beautifully. It’s relatively easy to plan a landscape without hardscaping, but in most climates (and certainly here in Northern Virginia), hardscaping can look harsh and cold without plant life to warm it up. A comprehensive landscaping company like NOVA Landscape & Design can deliver stonework and plant life, all in one project.